Greg Kuzma's "Hose and Iron: Selected Poems," published through SFA Press, is named a finalist for the 2018 High Plains Book Award for Poetry. NACOGDOCHES, Texas - A poetry book written by prolific poet Greg Kuzma and published by SFA Press, has been named a finalist for the 2018 High Plains Book Award for Poetry. 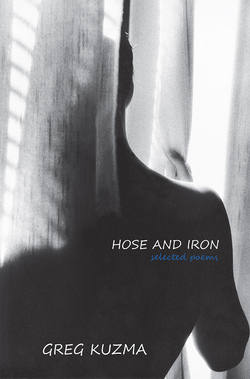 "Hose and Iron: Selected Poems" was published in 2017 through SFA Press, a publishing entity that operates through Stephen F. Austin State University. Kuzma, who has published more than 1,500 poems during a 50-year timespan, lives in Nebraska, but chose SFA Press to publish his latest collection of poems. For Kim Verhines, SFA Press director, this nomination confirms the quality of books being published through the press. "SFA Press produces beautiful books," Verhines said. "This award is even more special because two of SFA's graduate students, Jerri Bourrous and Jonathan Grant, edited and designed the book; both were graduate interns at the press and had the opportunity to work in book publishing as part of SFA's transformative experience." The nomination is open to national and international presses that have published writers from both the U.S. and Canada. The authors live in states that include Montana, North Dakota, South Dakota, Wyoming, Nebraska, Colorado and Kansas, and in Alberta, Manitoba and Saskatchewan Canada. Verhines said that while two other finalists also are located in the High Plains region, she believes SFA Press stands out among larger and longer-established presses. "SFA Press is an extremely good publisher, and it's significant that a modest university press like ours can garner this type of national attention," Verhines said. "It gets SFA's name and brand out to a larger public, and it helps to make people knowledgeable about the work being done here and the opportunities we provide." Visit the SFA Press website at sfasu.edu/sfapress. For more information, contact Verhines at verhinesk@sfasu.edu or (936) 468-1078.